Machetes are invaluable tools that we must carry on our camping or hunting trips. Essentially, they can do all primary duties that hatchets and survival knives can. Moreover, they are not just for camping, but they are also widely used in agriculture. Farmers don’t go to their fields without a machete tied to their waists. This is because machetes are very versatile tools, and they can hack away tall grasses or even harvest their crops. Not only that but if you’re lost in a forest, you can use one as a survival tool to make your path or build a makeshift shelter. 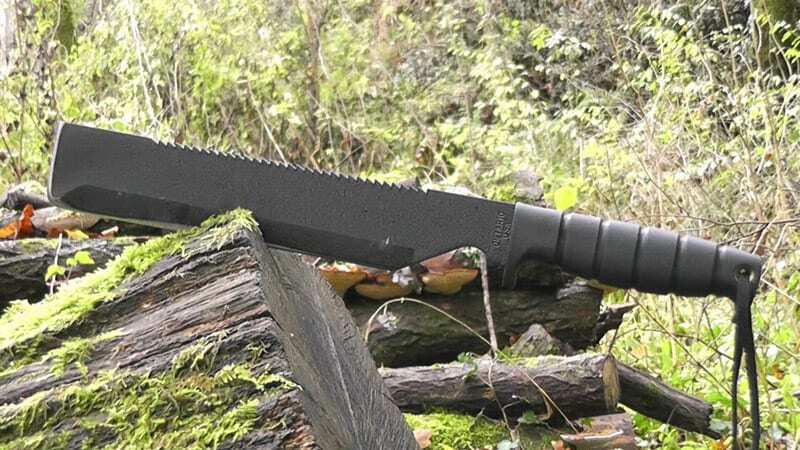 If the mention of ‘survival’ piqued your interest about machetes, read along this article to know the best survival machete in the market today, and we present you the buying guide that you can use to set your preferences. 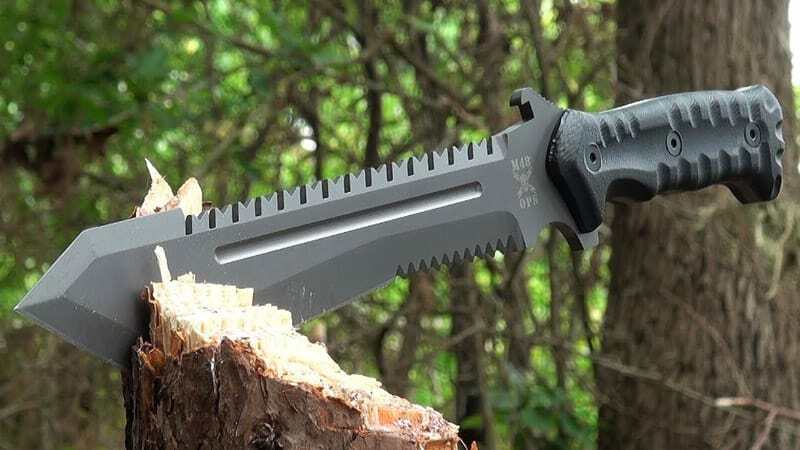 We listed five of the best survival machete that is preferred by users. Weigh your options if you’d like to have one of these according to your inclination based on their characteristics. This kukri-type machete may be small at 11.5 inches for its blade. However, its carbon steel material is exceptionally strong excelling in chopping and unearthing unwanted undergrowth in your backyard or a forest. Its handle is made of thermoplastic and won't slip away even if your hand is filthy with sweat. The full tang handle makes sure that your blade is connected with the handle in the safest way possible. 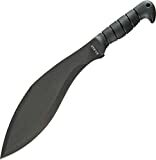 This machete is very popular in Amazon market, ranking in the top ten. It's easy to see why. Military men prefer this machete because it has the right amount of length (overall 17 inches) and weight (1.7 pounds) for everyday use. Also, the handle has a small hole that you can loop a cord through it if you want it tied to your person. Gerber is a renowned brand famous for its quality knives. 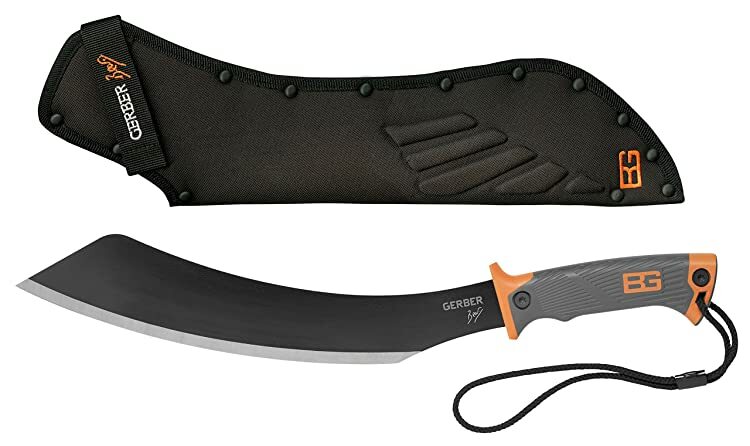 They also make machetes too, and this machete was based on Bear Grylls had demonstrated its capabilities numerous times in camping and survival purposes. With the curved blade length at 13.5 inches and weight of 1.2 lbs., it is good for clearing grass or chopping limbs. The carbon steel is very sharp and doesn't need to be often sharpened. The full tang construction induces durability and guarantees strength with every chop. Also, the handle is of the rubber grip, and slippage is reduced. Your safety is ensured because when you purchase one, it comes with a nylon sheath. Of course, if you liked your machete close to you, it allows you to loop a cord around it. This is a must-have in your toolshed or as your camping tool because it is different than most machete types. Why you can have the typical uses of a machete and also as a durable saw on the other part of the blade! This 26-inch machete gives high performance be it in chopping wood or sawing it in half. Since it's long, you can expect this to be on the heavier side. The individual length of the carbon steel blade and saw are 15" and 18", respectively. For its handle, slippage is nil because of the rubberized handle and optimized for absolute control while retaining comfort. When you purchase one of these, you also have a nylon sheath to cover your blade against rusting and accidental injuries. Even the military men have taken a liking to this machete other than hikers and campers. 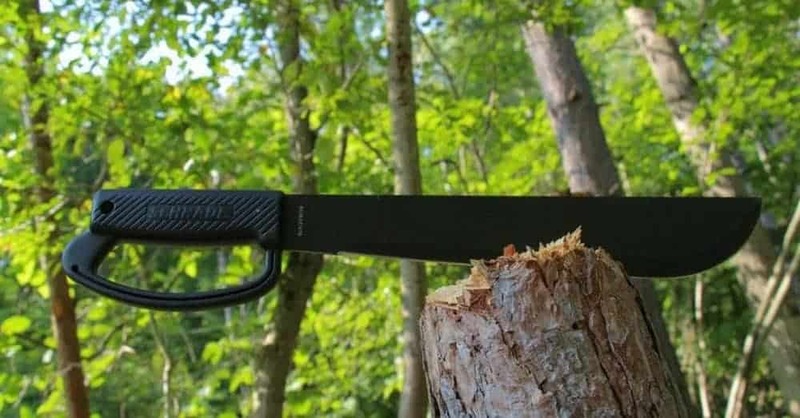 At a weight of 1.5 pounds and a blade length of 10 inches, this machete boasts its capabilities to hack effectively, chop and cut everything that comes in its path. In fact, other than chopping away, this machete has two other purposes that you can see from the design of the blade alone. The top part of the machete opposite to the blade is a saw, and the tip part is claimed to be a prying tool or a chisel. This blade is also full tang, made of carbon steel, and can maintain its sharpness for a long time. This is overall a good product, but the sheath is to be purchased separately. Its name says Zombie Hunter and its design is technically seen in most zombie hunting games. However, this machete is not only as an anti-zombie weapon, but you can use it like just any other machete. 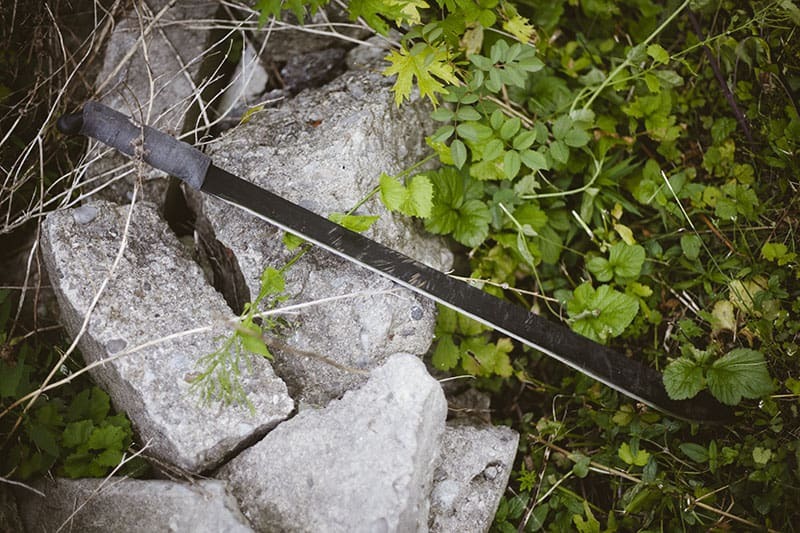 You can clear away tall grasses or cut down vegetation, and this machete is pretty versatile. At 24 inches long, this machete is different than the products mentioned above as they are made of carbon steel, while this one is of stainless steel. The blade is colored black, and the curved tip gives off a mighty chop. A machete, as mentioned earlier, is a multipurpose tool. When you’re out in the wilderness, you can cut down dense undergrowth to make a path which a powerful but fast swing. Like a hatchet, you can chop light firewood and tree branches. Between a machete and a hatchet, the former wins the match because hatchets can’t clear tall grasses. Also, when using a hatchet, you need to exert force while with a machete, you don’t need the swing to be powerful. It’s like a knife, though the size is several times larger. A machete has the same uses as a survival knife, but the applications are wider. For instance, if you hunted a large prey and planning to skin it, a machete can do the job more efficiently than a knife that could take a lot of time. Also, because it is a large knife that looks like a cleaver, it has a more sharp edge span that can be deadly if you don’t exercise caution. 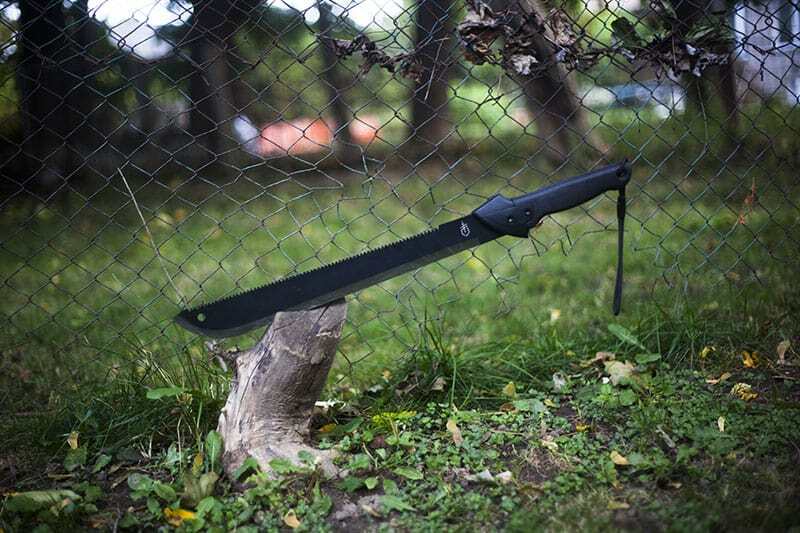 Not only a machete is used as a survival tool, but it is also used as a weapon for personal defense against large animals or even fellow humans. The look of the machete is very threatening, so it’s recommended that you bring it with you in an unfamiliar place. This is to ward off those who wish you harm. As a weapon, it’s more useful than a hatchet or a knife. Against a hatchet, a hatchet would need a space to swing it forcefully yet quickly, and the blade is much smaller. Against a knife, the knife has a lesser impact because of its size and the blade is also smaller. Machetes come in different shapes and styles depending on the country they originated. This type is the most common and is also known as bush machete and has the shape of being straight. The straight-backed blade has an even weight and is good for cutting or chopping. Kukri is a knife from Nepal but is similar to a machete. The kukri has three section on its blade. First is the wide midsection that is for chopping, then a narrow part for carving and whittling, and a pointed tip for stabbing. Kukri is good as a utility tool and for chopping. This type originated from the United States of America and is based from a famous frontiersman named Jim Bowie. This is also called as a survival machete and can do well in chopping wood. Not only that, it can be used to skin animals by its clip point or skinner tip. Also known as tapanga, this type came from Africa. The panga is easily distinguished from other types because of its broader blade curvature at the tip part towards the midsection. Panga has a typical length of 16 to 18 inches. This machete is superb for chopping because of its weight, and the curved tip can make slicing easy. Bolo originally came from the Philippines and they used it for agricultural and had a history of being used as a weapon for revolutions. The blade near the tip is weighted well for chopping and clear down a path with its power. This one is commonly used in Malaysia and Indonesia. It is similar to parang and bolo but is shorter. The midsection of the blade is curved but thicker for good chopping force at a smaller concentrated area. It has a prominent primary grind that keeps it from being stuck in the wood. Originating in Southeast Asia, golok is similar to parang due to its curved look. This type has a great chopping power. Its design is thicker than most machetes and can keep your blade from getting lodged in the wood. Below, we present the tips and guideline on how to select the best survival machete for your needs. 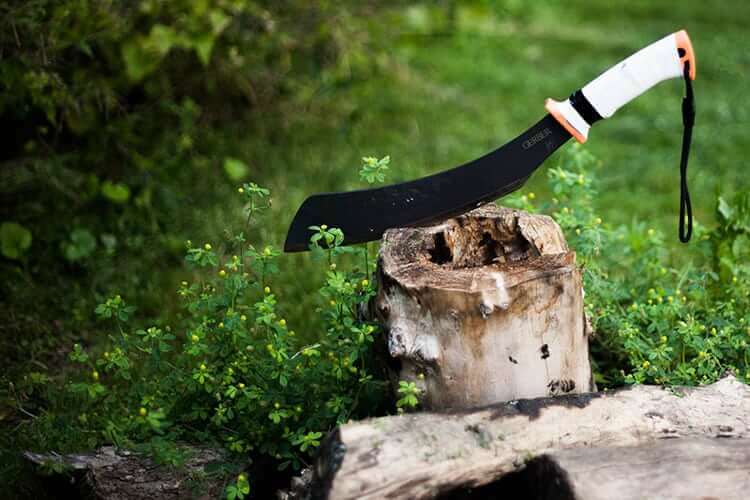 Not only is it for survival, agriculture, camping, or hunting activities, a machete is an excellent tool to have in your toolshed of your house for backyard cleaning. A typical machete can range around 18 inches. Some models are shorter around 10 inches but there longer ones more than 25 inches. In purchasing a machete, you should think where you would use it often. If you prefer to want to cut down grasses at a fast rate, a longer machete is good for you for its long reach, though it may be hard to carry around. But if you want it as portable as a camping hatchet, you would want to consider a smaller machete, though the rate in which you can cut down grasses is slower than with a long blade. The weight of the machete depends on how long the machete is. In choosing your machete, it highly depends on what tasks you’re supposed to do. The heavier and longer machete is good for hacking away branches or grasses in a wide area at a shorter time. The heavier machete is necessarily good for heavy-duty jobs. A smaller but lightweight machete is good for you if you plan to trek more in a wooden area as you can tie it on your hip. Also, the lightness of the tool will not weigh you down from a long journey. The blade of a machete is either made of carbon steel or stainless steel. Both have advantages and disadvantages that will set your preferences better. A machete made of carbon is very strong and harder than stainless steel. The sharpness lasts over time but it is susceptible to rusting. If you can prevent the rusting by taking care of it, carbon steel material is perfect for machetes. A machete made of stainless steel may not rust easily, but it loses its sharpness that makes it dull with every swing or chop. Know that a dull blade is inefficient and takes a longer time to get the job done. But if you have a sharpening stone with you, like in knives, stainless steel is a good material for your chosen machete. You can consider this material if you’re tight on your budget. In choosing a handle, it should be comfortable with your grip and make sure that the machete doesn’t slip from your hand due to sweat or being submerged in water. Handles made of rubber can give you firm clutch but can be brittle over time. The handle made of steel is long-lasting, but it may slip away especially if you’re sweating. To effectively choose a handle, try a few machetes before your purchase. To exercise the extreme precaution, you should buy your machete with a full tang that connects the blade and grip securely for more strength and durability. Of course, a sheath is necessary to cover the sharp blade of your machete. Without it, you and anyone close to you could be accidentally injured when you least expect it. 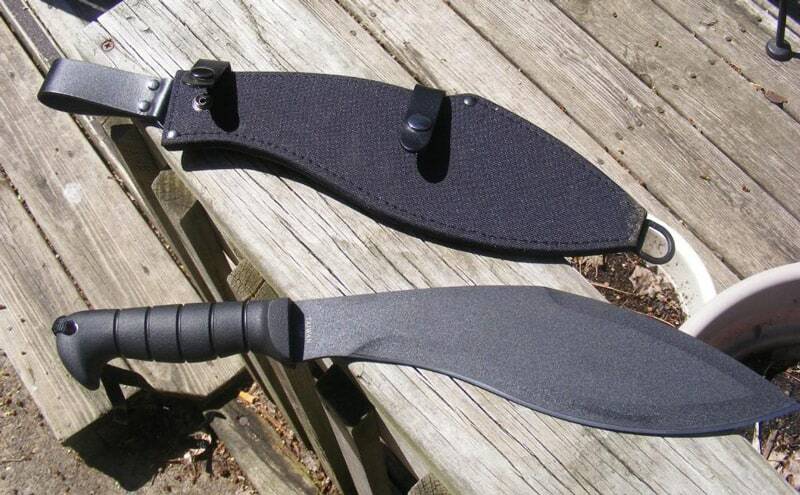 The sheath makes your machete less threatening and safe to carry around on your waist. The most common material for sheaths is nylon. This concludes the buying guide for the best survival machete. With the above factors to look out for, the machete that you have taken a liking on will prove to be more apt to your needs, wherever you plan to use it.